For a virtual tour of this property scroll down to the bottom of the text and click on the link. If viewing on the vrbo site click on the last picture and then the arrow to the right of the picture for the Virtual Tour. 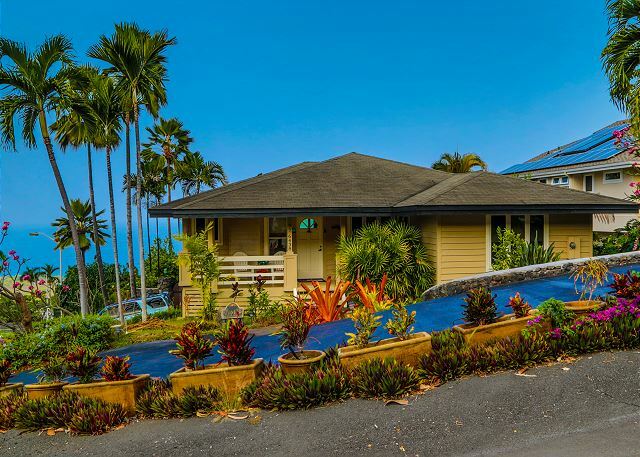 Hale Welo - "Sunset House" - sits above Kona at a cool elevation of 650’ with gorgeous drop dead ocean views to Kona Bay and beyond. 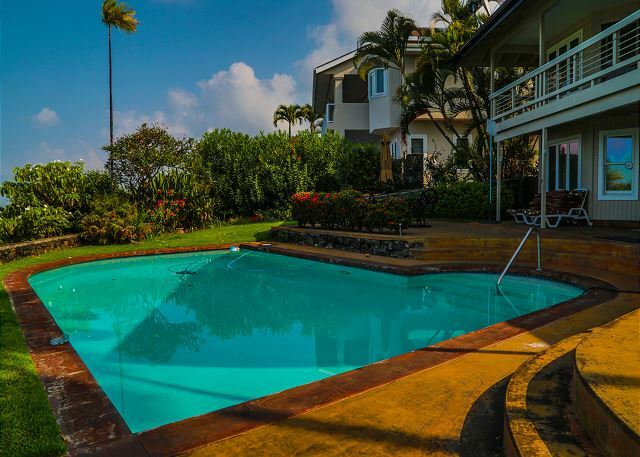 Hale Welo is a 3bd/3bth 2 story home with full size pool. 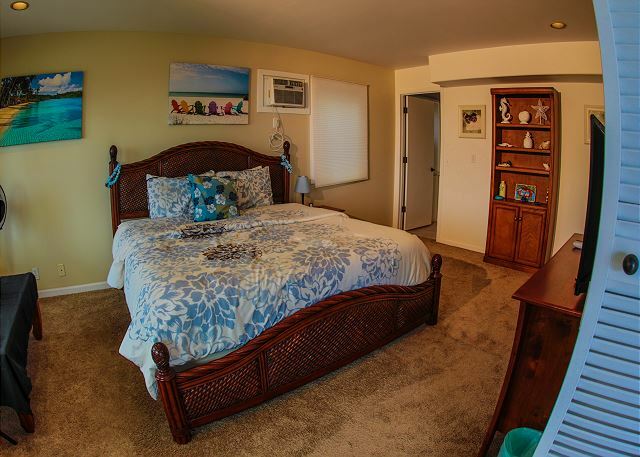 Newly upgraded with new paint, flooring, carpet, new furnishings, bedding, and appliances. 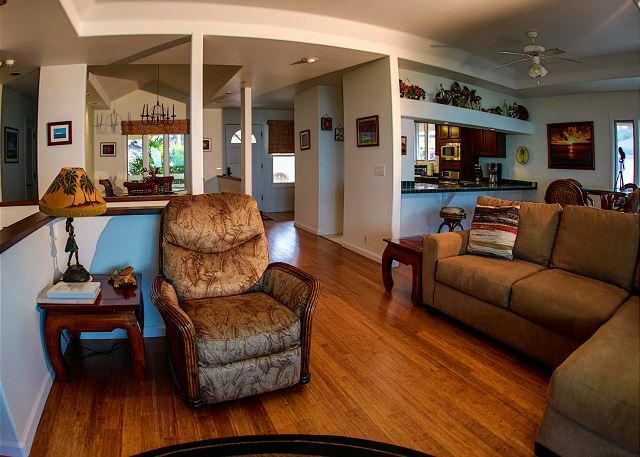 Spacious upper lanai with table & chairs & large comfy couch. 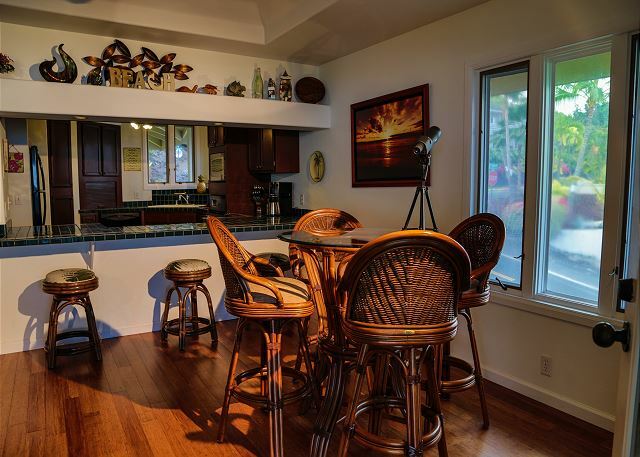 Lower lanai with large umbrella table that seats 8, pool & BBQ. There is a 55”HD TV in the living room with DVD and 39” HD TV’s in all 3 bedrooms. 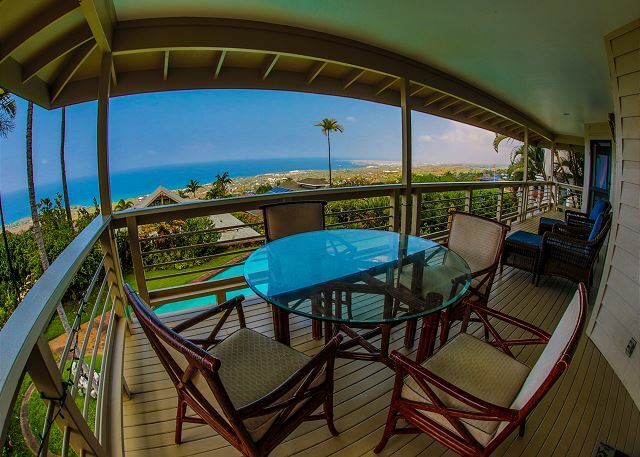 Beautifully appointed, cool and comfortable, with lovely tropical breezes and forever views, Hale Welo has everything for the perfect Hawaii vacation. 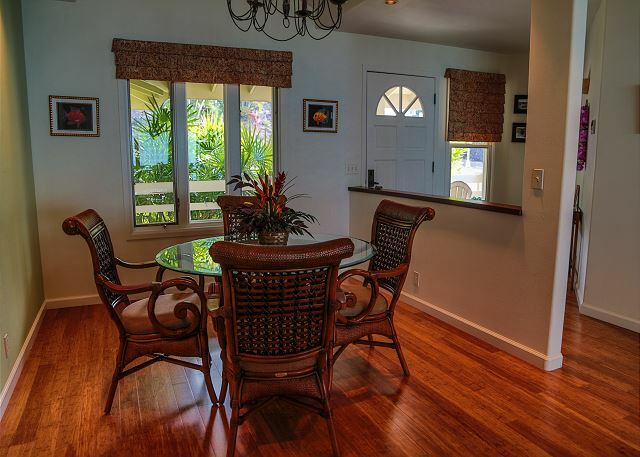 Located in a quiet sub-division of upscale homes yet just minutes to downtown Kona, shopping, restaurants, & beaches. Make your next sunset a Kona Sunset. Overall the home is very nice and has amazing views. There was an issue with the pool vacuum not running so the pool was not as clean as it could have been. The next door neighbors were a little intrusive and we almost felt like they were watching to see what we were doing. The basement bedroom is very large however there was a musty smell. If the carper were to be replaced with different flooring it would probably remove this. Location great...Neighborhood great...Latch on screen door nearly falling off...some lights out in bathroom and kitchen...poor lighting in bbq area...under bbq grill laden with old grease, caught fire while warming up unit...downstairs bedroom had big wrinkle in carpet and smelled information in house regarding recycling and garbage pickup day...first house that we have rented where the manager or owner hasn't contacted us shortly after our arrival...with a little more attention to some small issues, this unit could go from good to great. It's all about the view and the pool. Such a wonderful getaway. Thank you! Our expectation far exceeded what we thought it would be. Location, outstanding view & privacy were all within our reach. 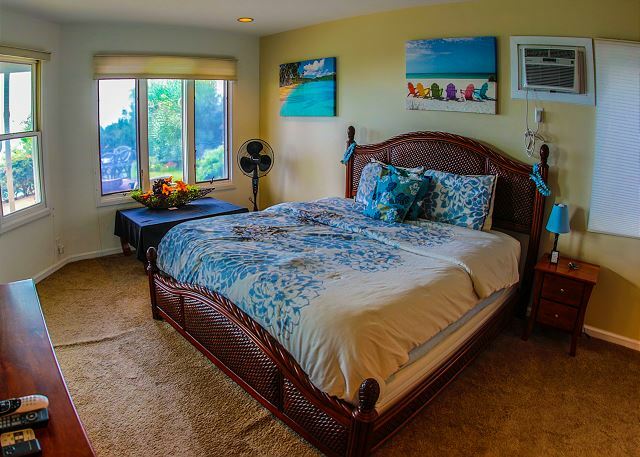 We would recommend Hale Welo to any vacationer. Clean house with wonderful view! This is a belated review. I stayed at this house for 5 nights in July. This house was very bright and spacious. The view from the lanai, and the house condition were much better than the photos. 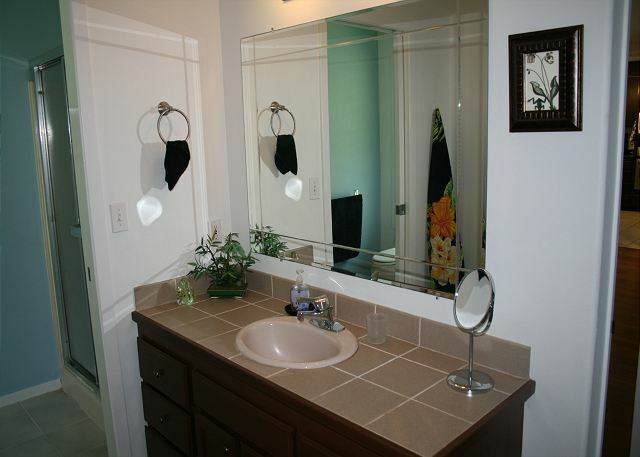 This house was adequately clean and well-maintained. The best points to us were the privately owned swimming pool and the amazing view from the lanai. 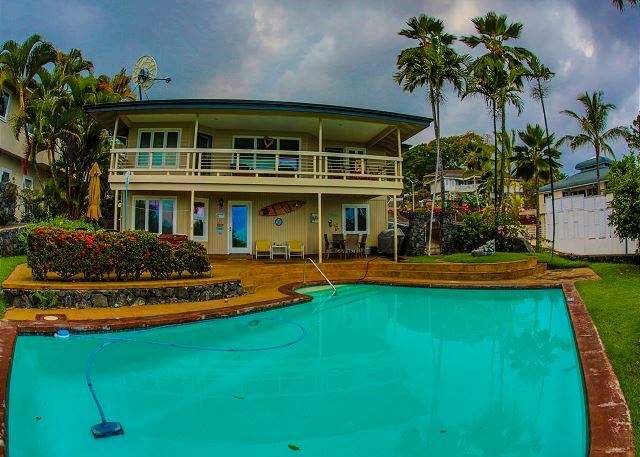 During our stay, every late afternoon, my sister's couple has used the swimming pool, and I and my husband enjoyed the Kona sunset at the lanai. Now, I'm so missing this house. This place was amazing! It looked just like the pictures and had everything we needed. My family enjoyed the swimming pool and amazing views from the lanai. This will be our go to rental when ever we visit kona. We had an amazing time! Great House, Great Pool, lovely views, good location. We wanted to explore beaches, sights, etc. and had the opportunity to do so. Drives, to Volcano Park, Hilo, tons of beaches, Great Weather, cooling breezes, made for a great trip! House was nice! 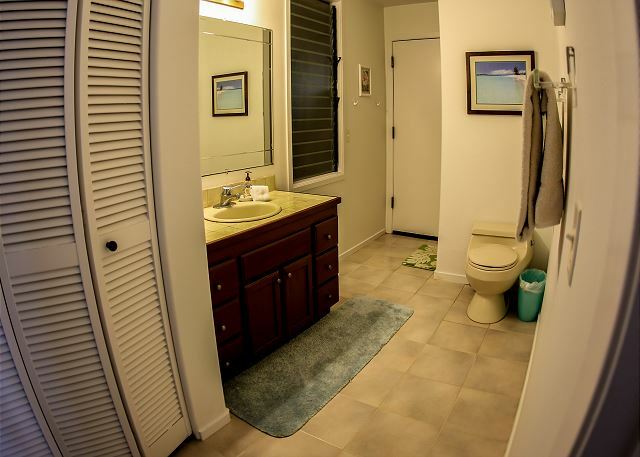 The screen doors to the upper Lanai and Master were worn...Front door handle to home was problematic, ran out of Toilet Paper, Gas for bar-b Que, dishwasher soap, Trash bags (i think that those should be provided for stays at a property, but it's not a big deal. I would gladly rent this property again. Mahal0! WHEN WE ARRIVED WE TURNED THE KEY AND FELT LIKE WE IN PARADISE. THE HOME IS BEAUTIFULLY DECORATED AND APPOINTED, AND DURING OUR STAY, NOT ONCE, FOUND OURSELVES IN NEED OF ANYTHING THE HOME DID NOT HAVE. 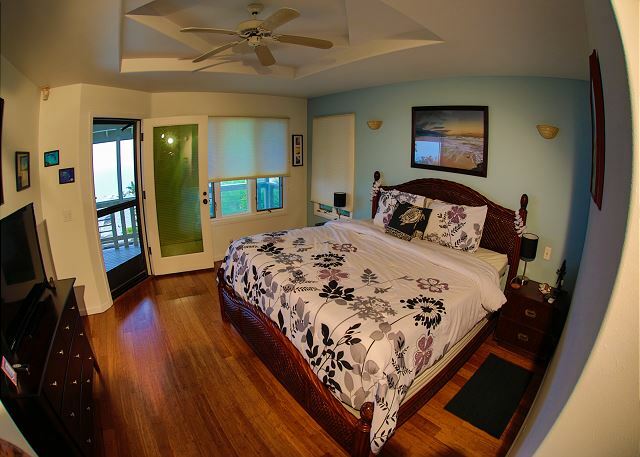 THE REAR DECKS/LANAIS, UP AND DOWN, OFFERED UNBELIEVABLE VIEWS OF THE OCEAN AND WESTERN SKY SUNSETS. WE FOUND THIS SO PEASEFUL AND RELAXING WITH TIME TO BE REFLECTIVE THAT WE SPENT MANY HOURS OF OUR TRIP DOING JUST THAT. THE GROUNDS WERE BEAUTIFUL AND WELL MAINTAINED WITH LOTS OF FRESH BLOOMING FLORA. THE POOL WAS CLEAN AND AT 80 DEGREES WAS VERY REFRESHING AS OPPOSSED TO THE 85 DEGREE PLUS POOLS THAT WE WERE ACCUSTOMED TO IN MEXICO. 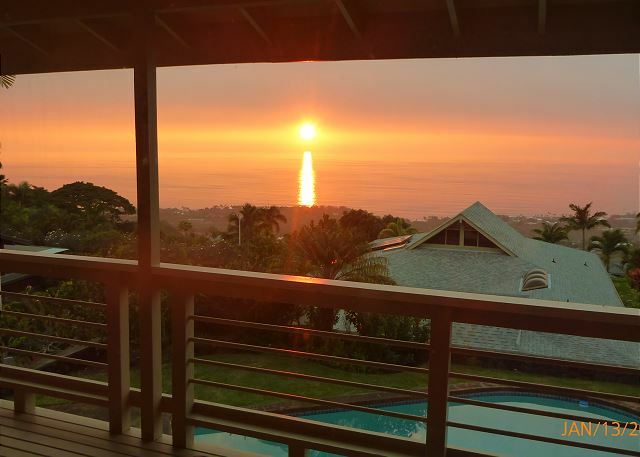 WITH ALL THE MANY THINGS TO DO AND PLACES TO GO ON THE BIG ISLAND I STILL THINK OUR FAVORITE TIME WAS BACK ON THE LANAI WITH A COLD BEVERAGE ENJOYING THE AMAZING SUNSETS. FOR ANYBODY LOOKING TO ENJOY A WONDERFUL VACATION EXPERIENCE, IN AN ABSOLUTELY STUNNING SETTING, I HIGHLY RECOMMEND A TRIP TO THE BIG ISLAND AND A STAY AT HALE WELO. A SPECIAL THANKS TO THE OWNERS, JERRY & MERILEE, AND THEIR PROPERTY MANAGERS, WAYNE AND SHARON, FOR MAKING OUR TRIP A PERFECT EXPERIENCE. Great house clean and well cared for, the cable box in one of the bedrooms was out and a sprinkler head in the backyard broke the last morning we were there. I emailed the contact person but didn't get a reply, which would have been appreciated. The pool and gardens were amazing. 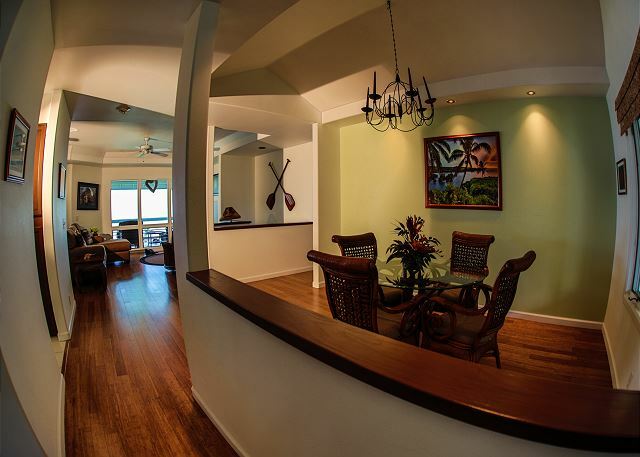 Five us stayed comfortably in the 3 bedroom, 3 bath home with a beautiful view of the ocean and Kona. The home had all the conveniences of home. It was a pleasure to enjoy all the home had to offer. We all slept well, enjoyed the lanai on the top floor and the deck at the pool. We saw sights all around the island and loved having the house to come home to. It was truly living in paradise. Although it was expensive in Hawaii and food cost was high, it was nice to be able to cook at the house. We bbq'd and cooked most of our dinners and breakfasts. This helped keep the food bill down some. Thank you for making a dream come true - we loved our Big Island vacation. We had an amazing stay in this beautiful home. There wasn't anything we had want for. Beautifully located with the morning view and evening sunset displays we could of stayed out on the Lanai the whole visit. It was so well furnished with every need, including great pool toys for the wonderful swimming pool. I would rent this location every time we go to Kona. Easiest arrangements I have ever made. Having never stayed at a vacation rental I was pretty nervous but the second I walked into the home I was so glad I decided to try it out! The pictures didn't lie, the home and views were incredible. My family of 8 had tons of space and being able to cook our own meals AND do laundry was priceless. The view from the lanai gave us the best seats in the house that we never get at restaurants. The view...amazing sunrises and sunsets! On top of that, shopping and beaches were only a short drive from the property. Super convenient! Not only would I highly recommend this home but my family and I hope to come back to it! We truly didn't want to leave. The house was clean and ready when we checked in. Two smoke detectors in two bedrooms were chirping upon on arrival. They needed batteries. Our original rental was pulled out from under us and we were so glad because we were able to rent this home instead. When I emailed the owner he answered the same day and we had the house booked by that night. The pictures don't do this house justice. It was so nice and in a great area. The view from the back deck was our favorite. We still miss seeing the ocean every morning. We would choose this home if we come again. 10 minutes from beaches and shopping. No boogie boards but sand toys beach chairs, also inflatables for the pool. We loved our time in Hawaii and this house was a big part of that. 5 stars!! We arrived on June 13 for a two week stay to celebrate my mother's 80th birthday. The first week we had 3 of us staying in the house and the second week there were 7 of us. The house is wonderful. The pool was clean and just the right temp. There are plenty of pool blow up items in garage as well as ice chest and beach towels. The house was everything we expected and more. We ate every dinner on the beautiful lanai watching spectacular sunsets. From the time we booked through our stay -- Wayne was easy to reach and very respectful. There were a few missing items that would have been nice to have -- so we bought them. Windex for cleaning all those glass tables as well as the windows in the livingroom. We also needed to purchase plastic garbage bags as there were only two there, which for a two week stay wasn't enough. The baking dishes were all small sized -- 8 X 8 being the largest, we purchased and left there a 13 X 9 glass baking dish. We fell in love with the little tabby kitty "Kona" that was a constant visitor. Can't wait to book again -- excellent! I can't say enough good things about our trip, but the best was our home we stayed in. We will never stay in a hotel again. Coming back to a home after your days of sites and tourism was amazing. Our kids loved the home, the view, and most definitely the pool. Don't forget the frogs and lizards! I can't thank VRBO and the home owners enough for making our family vacation flawless. Nice and clean. Good pool and fabulous sunsets. overall an A. We all enjoyed our week visit, spending most of the time on the deck and by the pool. The view of the ocean is fabulous and we even saw a rainbow one morning. This is a lovely home. Spacious, very nicely furnished and we had six people stay for 7 nights and no-one felt cramped at all. We used the washer and Dryer, and the swimming pool was awesome at 82 -84 degrees every time we swam! I would recommend this to anyone with a group!! Jacqueline P from Delta, BC does not recommend this vacation rental. This is a nice home with a great view. The king bed in the master is very comfortable - we didn't use any others as there was just the two of us. It was easy to find and the instructions to enter were simple. All in all a good home but there were a few detracting factors. 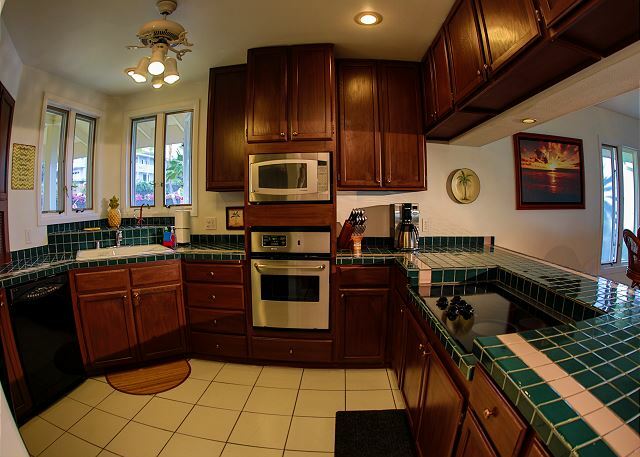 The kitchen could use some upgraded utensils/pots/pans - but that is minor. The washer/dryer are old and worn out and need to be replaced. There was a strong odour of mould coming from the stairwell, it extended into the lower bedroom. Perhaps it's coming from under the new flooring? 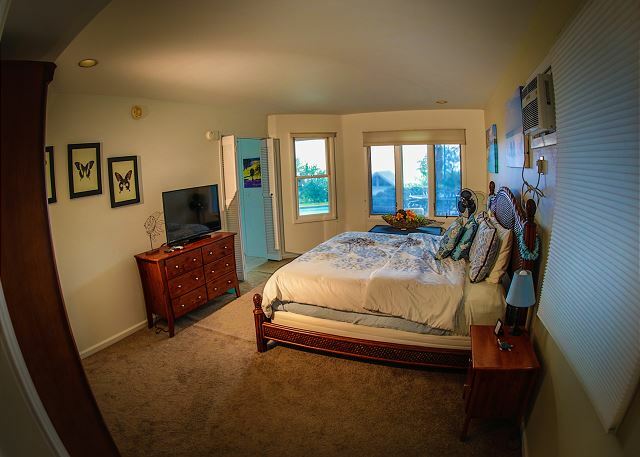 The area between the dining room and bedrooms upstairs was soft and felt squishy underneath. Not sure what that's about. There were a few dead geckos in the home but to be expected. Our biggest issue was with the property manager Wayne Twitchell. Upon our arrival we realized that the pool was very cold. It was at least 8-10 degrees colder than the ocean. 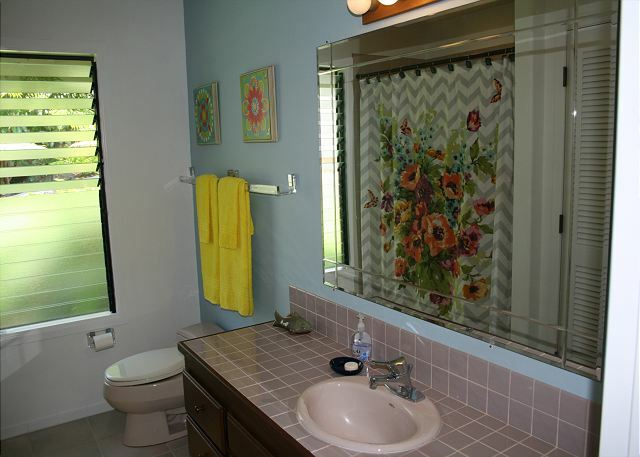 We chose this home because this property is listed as having a solar heated pool. It is far from heated and was the same temperature as some of the unheated pools at houses I've rented in the same area in the past. Wayne was condesending and disrespectful to me when I contactd him by email - suggesting I don't know the difference between a hot tub and a swimming pool among other ridiculous comments - and he refused to compensate for this as we felt the ad was misleading. There should be at least some difference between a non heated pool and a heated pool. We dipped in the pool a couple of times but it was far too cold to swim in for any more than a minute or two. I would hope that the owner would contact me directly if they would like copies of the correspondence between Wayne and myself. The home itself is nice but because of the issues we had with Wayne I would not recommend this home. When I was first contacted about the temperature of the pool I sent the pool guy over to check it. He found a vapor lock in the system not allowing the water to reach the solar unit on the roof. He cleared the lines and then returned the next day to insure it was running properly., which it was. I sent the person who had installed the solar system over to check on it as well. Finally, I went over to the house and got in the pool myself. Both the pool guy and solar guy told me the system was running properly. From my own experience I felt the same. I explained this to the guest. I also told her that with a solar system on cloudy days the pool will not heat up as much. She felt this explanation was an insult to her intelligence and wanted to be reimbursed. As she was the first person to have ever complained about the temperature of the pool and from the reports I got from the 2 professionals monitoring the pool, I felt her request was unique and unwarranted. I was not at any time condescending or disrespectful. That is not the way we do business. 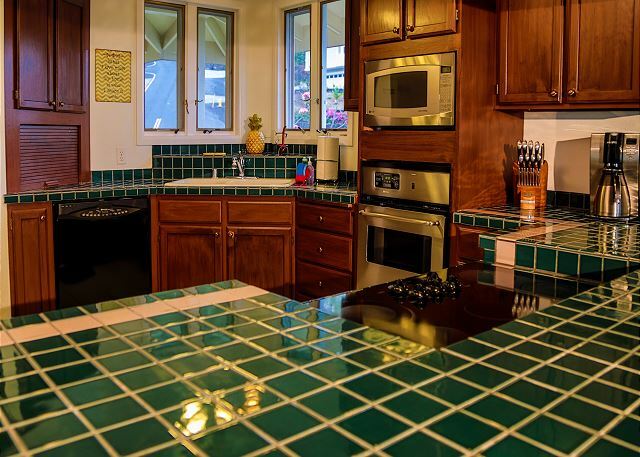 I am sorry the guest chose to use this as an excuse to taint the allure of a lovely property enjoyed by the many other guests who have sited Hale Welo as one of their best ever getaways. 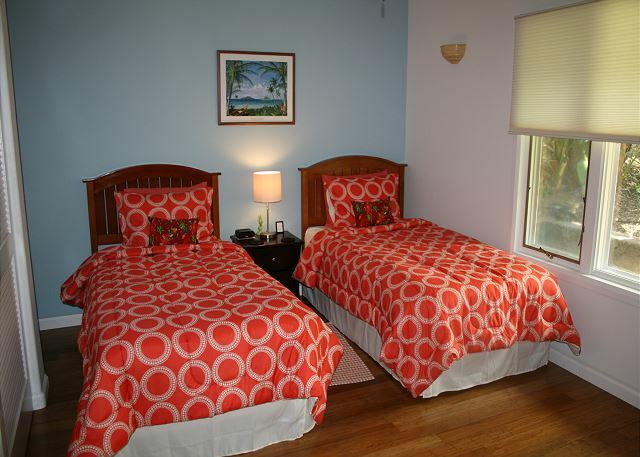 At Kona Sunsets Vacation Rentals we take the condition of our properties and our guests enjoyment very seriously. We have maintained a 5 star rating with the Better Business Bureau over the last 10 years. This rating comes directly from guests experiences at our properties. Respectfully submitted. Mgmt. Hale Welo was a wonderful place to relax and enjoy what the big island has to offer. We spent a lot of time just hanging by the pool and grilling. Perfect! Just as described. The view was to die for. You will not be disappointed. Great location, perfect for family, well equipped. Aloha! 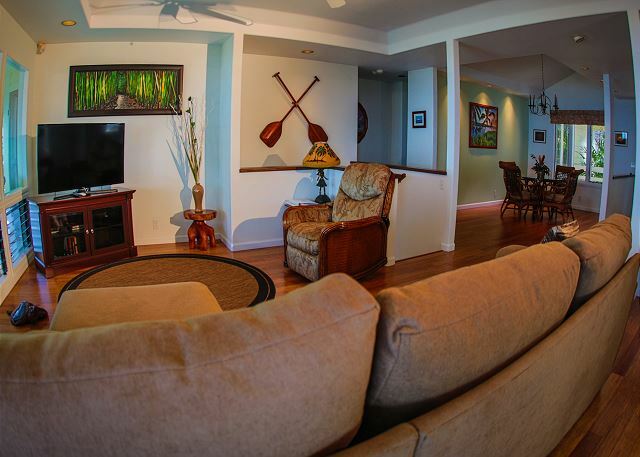 Hale Welo was an excellent vacation rental for our group of three couples. We enjoyed morning coffees and evening sunsets from the upper lanai, which also included being able to watch whales! Our private pool and yard were well maintained, as was the entire house. The only suggestion we would have is that some of the kitchen cutlery and cooking pans could use an upgrade. The property was clean, although a couple of small things were missed (stove top was sprayed but not finished wiping down; bathroom shower looked like it had been missed and no bathroom cleaners provided). Otherwise, this place was totally awsome and we would strongly recommend it. 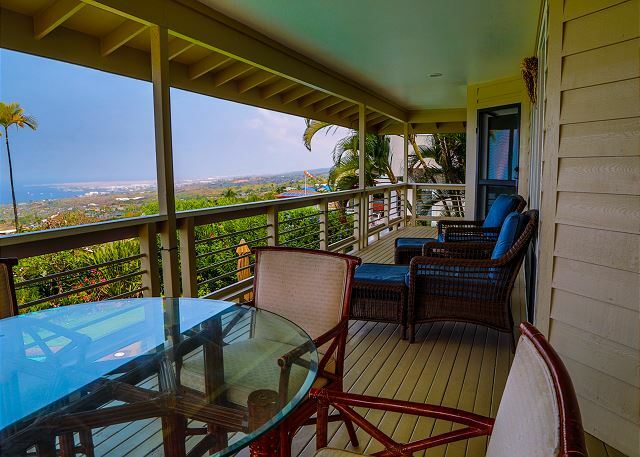 The pictures do not do justice for the actual full view of the ocean you can see from the upper lanai. It is in an upscale area and we went for frequent walks just enjoying the beautiful scenery all around us. 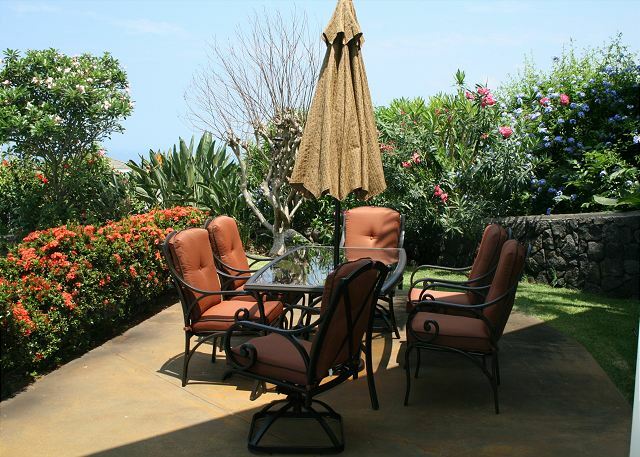 We would not hesitate to recommend or use Kona Sunset Vacation Rentals. We inquired about getting further propane for the barbeque as we were getting low and they delivered a full tank the next day. This was one of our best vacations. So much to see and do! We spent a wonderful week at Hale Welo. The house is pretty, very clean and was so convenient for our 3 kids family. Wayne, from Kona Sunsets rentals, was very professional and helpful every time we needed him. We highly recommend Hale Welo. Nous avons passé une semaine formidable à Hale Welo. La maison est belle, bien équipée, confortable et très propre. Elle était parfaitement agencée pour notre famille de 3 enfants. Wayne, de l'agence de location Kona Sunsets rentals, s'est montré particulièrement attentif et a su aider à rendre notre séjour inoubliable. Nous recommandons la maison et son agence.